Thursday night after ten pm I spent more than an hour watching clouds scud by the tops of the highrise towers outside my apartment. I was so intrigued by the appearance of the cloud banks, the tops of the buildings and the occasional visible star (there were two, but I think one was a planet) that I dug out my Sony DSLR and experimented with some long exposure shots. As a photography session it was of limited success. I don't really know what I am doing with that camera, but I managed to get some mildly interesting and evocative snaps, more of interest as documentation than art. One is shown above. In one respect, however, the evening was a complete success: it was really relaxing doing something so harmless and random. I had a similar sensation at Christmas, when I spent about half an hour blowing soap bubbles with my niece Orli and my dog Lucy. Both Orli and Lucy liked to chase the bubbles, and I liked to see how many I could blow with one breath. There is something so engaging about doing...harmless, stupid nothing! I recommend it. Of course, my evening came good last night almost as soon as I had turned off the television. It is so liberating to suddenly silence that dreadful device, and a calm settles on the apartment almost instantaneously. The room 'depolarises' - it is no longer a tunnel pointed at the screen - and I can hear myself think. In this state I turned my mind to alternative forms of entertainment - I'm not a monk, after all - and I settled on the digital comic. The iPad was made for comics, but they take quite a while to download. While I was waiting I got in the habit of staring up at the clouds, which I could just see from my reclined position on the sofa. Waiting for comics slowly became more interesting than reading comics, and the aforementioned photo session ensued. This particular patch of sky is, relatively speaking, tiny - but no less captivating for that. 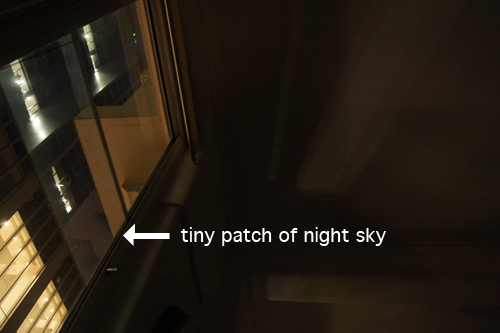 Certainly I can see more sky out of my western windows. However, given the choice of being down near the street or up near the clouds, I think I would still stick with down near the street, looking up at the clouds. What's that Wilde quote - we are all in the gutter, but some of us are looking at the stars? That's how I like it. In my apartment, my floor level is about ten feet above the heads of pedestrians walking on the pavement below, so I am not too low, but I still feel connected to what is going on. Certainly I hear and see everything that happens outside, but safe in my perch, passersby can't really hear or see me going about my business. To be just above street life, and yet able to see the sky - that's the perfect balance. In the last few years, I have probably only had half a dozen nights spent in without the television to provide its chattering company. I would like to see the television become the exception, rather than the rule, of a night spent alone in the company of my various companion animals. I don't see any real obstacles to this: I enjoy a measure of evening and weekend solitude, which balances out my busy, people-filled week days. Quite apart from the refreshing contrast, I am also interested in this condition of solitude that Rainer Maria Rilke discusses in his 'Letters to a Young Poet'. Rilke speaks of a need to 'scale the depths of solitude' in order to find the inner impulse to be creative. I like this, not the least for which it forms such a pleasant contrast to the relentlessly 'social' agenda of new media and technology. The idea of creative production being deeply personal and driven by a quiet solitude is a contradictory note in these collaborative, connected times, and this alone recommends it for further attention. Alternatively, I might invest in some detergent, bend a wire coat-hanger and spend my evenings blowing bubbles at my dog. It's all good.